Summer is officially over, IFA has come and gone, Samsung presented the new Note, and Apple unveiled the latest iPhones, but there's still plenty to look forward to in the smartphone world. Many top manufacturers are still holding their big hitters in reserve, ready to strategically deploy them this fall. Here are all the devices that we’re looking forward to in the coming weeks! The new LG phablet, codenamed Storm, has been brewing for some time and the clouds are about to burst. The LG V30 impressed us last year with its design and performance so we're hoping for an impressive showing from the successor. Fully named the LG V40 ThinQ, expect AI to be the watchword when it comes to functions and optimization, but LG is also proud of its first device with a triple rear camera. The LG V40 will have a triple main camera with three different focal lengths. In addition to a normal lens, the device will sport a telephoto lens and of course, a wide-angle lens. At the IFA in Berlin, we got our hands on the spec sheet for the LG V40 and it doesn't disappoint: a Snapdragon 845, 6GB RAM, 64/128GB of internal memory, and a 3,300mAh battery and five cameras. Release date: LG has announced that the launch event will take place in New York on October 3 at 5 pm local time. Google Pixel 3 and XL...a notch too far? For the true fans of software (come on, I know you're out there), there is one definitive Android smartphone, that can only be Made By Google. Not only will the Pixel phones be responsible for showcasing the full potential of Android 9.0 Pie, but they should also be the standard bearer for Google's excellent computational photography, as was the case with the Pixel 2 and Pixel 2 XL. As with the previous generations, we'll get a 'regular' Pixel 3 along with a bigger XL version. Not many mysteries remain about the Pixel 3 XL, as a cascade of leaks have basically revealed it ahead of time. Much to the disappointment of Pixel fans, the XL model appears sporting a massive display notch, a divisive design trend that looks all the worse on a Pixel phone because of the association with the rival iPhone X and successors. The Pixel 3 XL's optimized Android experience may well convince haters to swallow the notch anyway, or perhaps they will simply opt for the more classic standard Pixel 3 instead. Whatever you think of the controversial cutout, a new Pixel event should still set the standard for excellence in Android smartphones. Release date: Google has confirmed the launch event for October 9 in New York City. The original Razer Phone, released last November, unexpectedly kicked off one of the biggest mobile trends of 2018. With the arrival of the Xiaomi Black Shark, Honor Play, Nubia Red Magic, Asus ROG Phone and the Galaxy Note 9's Fortnite launch deal, it seems like everyone wants to be a gamer now. Why did gaming phones become such a big trend? While the Razer Phone's 120Hz display did result in a fantastically smooth experience running the top games that supported it, the gamer's smartphone didn't offer all that much more for gamers than other similarly high-spec devices. Razer clearly needs to step up their game, but so far we haven't seen many concrete details about what it will offer to challenge the new competition. Naturally, top of the line specs including the latest Qualcomm chip, and at least 8GB of RAM are expected, as well as improved storage space and a larger battery. Interestingly, a bit of flair could be added in the form of a dedicated Chroma app for controlling LED lights on the back. Although it looks like the next Razer Phone will keep the rectangular shape of the first, this could be exciting for those who have been hoping to see Project Linda, a 13-inch laptop dock for the Razer Phone, become a commercial reality. Release date: Razer has sent out invitations for a launch event on October 10 and the keynote will start at 6:30 pm. The Huawei Mate 10 Pro made plenty of headlines last year, not just because it's a great smartphone but because the unexpected scuppering of high-profile US carrier deals for the device by the federal government due to national security concerns. 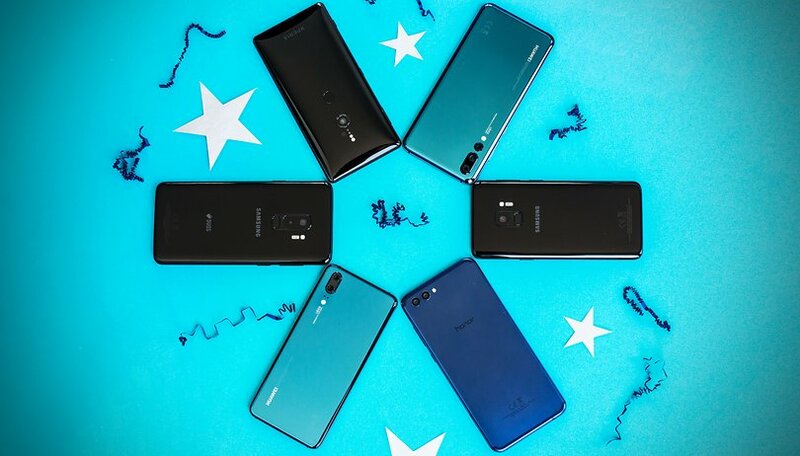 Since then Huawei may have pivoted away from the US market but the Chinese brand has continued to develop its technology and extend its dominance over the rest of the world, overtaking Apple to become the second biggest smartphone seller behind Samsung. The Mate 20 Pro will be the first smartphone on the market with Huawei's new Kirin 980 chipset. Huawei is confident that this new AI chip will be smarter and more powerful than any other smartphone processor on the market...even Apple's A12 bionic. Of course, we'll reserve judgment until we can try it, but we can't wait to give it a spin. Release date: At his IFA keynote address, Huawei CEO Richard Yu announced the date for the big unveiling, which takes place in London on October 16. The upgrade to 2018's first-class flagship killer is expected just a day after Huawei's event. Fans who have been holding out for a higher-spec version of the OnePlus 6 will get what they want, but it's also going to drop at least one popular feature. Audiophiles may be disappointed to learn that the OnePlus 6T will discard the headphone jack, but what will we get in return? Well, OnePlus has confirmed that the phone will feature an in-display fingerprint sensor. We can also expect the presence of Face Unlock, the latest Snapdragon 845 chipset and 6/8GB RAM. CEO Carl Pei has also promised an improved battery life "substantial enough for users to feel it". In a first for the Shenzhen-based smartphone manufacturer, the OnePlus 6T will launch with the backing of a major US carrier, namely T-Mobile. Release date: OnePlus recently showed a screenshot from the 6T with a date on it...October 17, 11:00. While this isn't an official invitation, it's likely to be a tease for the launch event. Honor Magic 2 to take the stage in October? Honor wowed us at IFA this year with a special surprise pulled out of its sleeve: the Honor Magic 2. With the 7nm Kirin 980, 100% display/body ratio and mechanical camera, the Magic 2 will showcase the Huawei sub-brand's most innovative technologies. Other features include the 40W ‘Magic Charger’ with 15 layers of protection, meant to work much faster than existing charge methods. The Magic 2 could help Honor become known as more than just the cheaper version of Huawei, and show a daring that would be better suited to the 'For the Brave' slogan. While Honor promises much, we'll have to wait and see if the Magic 2 can really deliver. And we might not have to wait so long. Release date: According to an unofficial teaser image leaked by Android Pure, the Magic 2 will be launched on October 26. But lacking any official confirmation, it's best to take this date with a grain of salt. Xiaomi is enjoying a moment in the sun, with the Pocophone F1 attracting a lot of attention due to a fantastic price/performance point and no-frills attitude. But the Chinese brand's real showstopper has always been the MIX series. The Mi MIX 2S has already impressed us a lot and we're looking forward to the follow-up. In addition to flagship specs and the trademark bezel-less display, the Mi MIX 3 should come with an intriguing sliding camera solution in which the front and back of the phone actually slide apart to pop out the camera. But that might not even be the best part, as the Mi MIX 3 has been confirmed to have 5G compatibility. While Xiaomi has yet to make its big entry into the US market, previous devices in the MIX series have been global phones, so there's still hope for those who want to be early adopters of this up-and-coming brand. Release date: Initially rumored for a mid-September release, Xiaomi President Lin Bin recently revealed on Weibo that the phone had been delayed, with Lei Jun and Donovan Sung also weighing on on social media to declare an October release. So far, we're still waiting for an exact date. Which is the most exciting upcoming smartphone? Do you already have your eye on one of the above smartphones? Or perhaps you're holding out for something more niche, like the RED Hydrogen One? Let us know in the comments! not interested in any of this predictable horse ****. A bunch of string you along disposable crap. The phones are only as good as the battery in it, so when a non removable battery gets old after a year or two, you might as well throw the phone away . if there are no removable batteries in any of the new phones, I'm not buying anything. The problem I have there is not a new phone out or coming anytime soon that I am excited about. All new phones are about multiple cameras and other gimmicks to justify there high price. Just give me a phone with decent specs, a removable battery, and reasonable price, I will get excited about a phone again. Of all the phone models presented here, I personally prefer the Huawei P20 Pro. The choice is subjective, more because I like how Huawei has evolved lately, but the other phones are zenzationale, making the choice of a single model basically difficult. My curiosity goes to Honor Magic 2, with that 100% display / body ratio and mechanical camera, which I can not wait for future articles on this blog. A little disappointment I have for Pixel 3, who does not want to give up that pretty annoying notch, now being just a little bigger. I'm glad to see such a review of all new phones, and I like to follow their evolution further. Thanks. Where will you go when Samsung does it? Why do all reviews keep going on about what the camera can or cannot do? Lets be honest most cheap point and shoot cameras will out perform the best camera that a smartphone manufacturers can make, so lets get real if you are serious about photography then you'll buy a camera not one of these top smartphones for nearly a £1000.